Striata Spotlight Insights Are you listening to your customers? 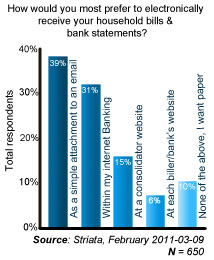 During February 2011, Striata conducted a direct consumer survey in order to answer one critical question: “How would you most prefer to electronically receive your house bills and bank statements?” This edition of eBilling Insight discusses the results of the research, which confirms that email bill and email statement delivery is the top consumer choice for electronic delivery. 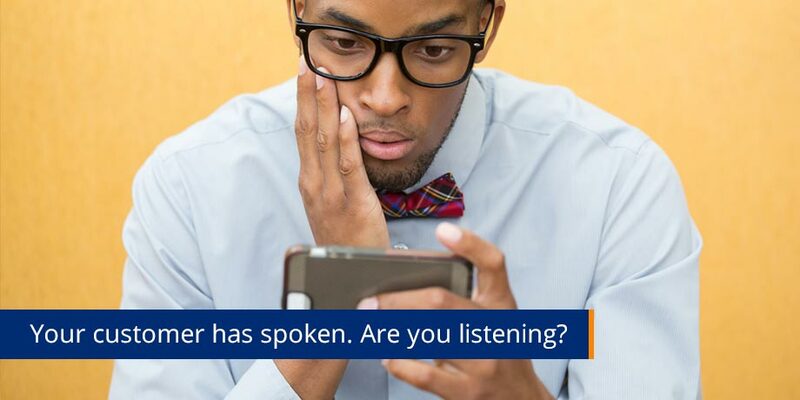 eBilling & eStatements: Are you listening to your customers? This survey was targeted at a very specific group of consumers: economically active business people from the age of 35 to 54 with broadband internet access – exactly the consumers who should all be paperless today. Currently, the vast majority (in excess of 75%) are still getting all of their bills and statements in the physical mail. However, 55% to 75% of these same consumers are paying their bills electronically. Our goal was to find out why they are still relying on paper mail. The answer we received was very specific – billers and banks are simply not offering them what they want. The survey received 650 uniquely identifiable responses and respondents were required to register or be registered in order to vote. 57.6% of respondents fall into the targeted age group followed by 30.7% falling into the 25 – 34 age bracket. At the close of the survey, the majority of respondents chose email delivery of bills and statements. Similarly, in a late 2010 report published by InfoTrends: ‘The future of electronic presentment & payment in North America’, email delivery topped the consumer’s vote for electronic channel preference at 46%. The results of this latest consumer survey were then compared to a similar Striata survey carried out in 2008 where email delivery of bills and statements was the favorite with a majority vote of 43% followed by Internet Banking. In all three surveys the message from the consumer is consistent: email delivery for bills and statements is their first choice, with a further interest to receive a copy in their Internet Banking. The options for registering at a biller website or consolidator website to fetch these documents remain the most unpopular choices. Respondents to the 2011 survey were also encouraged to comment on their vote and we found that the most common reason cited for reluctance to sign up for customer self service options, is the associated registration and login requirements. The popular choice for email delivery provides convenience and familiarity. How do billers & financial institutions drive self-service then? With these consistent messages coming from the consumer in favor of email delivery, how do billers and financial institutions satisfy their drive for website based self-service? The answer is not to tie paper suppression to self service portals or internet banking registration, but to focus on migrating customers from paper to electronic delivery by offering the delivery choices that they want. “Billers have a significant challenge currently and it’s escalating, in that the trend is moving away from electronic payment at their own websites, to payments originating through the consumer’s internet banking. As bill payment was the primary reason they registered and visited a biller’s site in the first place, this consistent trend is going to have an adverse effect on website usage. In addition, it is far less convenient viewing your bill at the biller’s website, compared to the two seconds it takes to open the paper envelope, so there is just no meaningful incentive to do so,” says Garin Toren, Striata Chief Operating Officer. Is it possible to achieve both paper suppression and self service portal usage? If payments are going through internet banking and paper is the preferred bill viewing option, how do banks and biller’s achieve both paper suppression and self service portal usage? 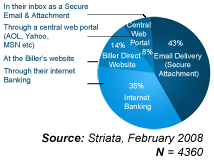 By providing a comprehensive solution utilizing email delivery, traffic to self serve portals can be maximized. Because no registration is required for email delivery, paperless adoption numbers are much higher than industry averages of 8% to 15%. The attached bill or statement can then include multiple personalized, intelligent links, banners, buttons and inserts that drive the customer to banks or billers websites for self service, up and cross-sell. The benefits of customer self service at a reduced cost is undeniable, yet statistics show that in the past ten years, North American consumers agreeing to turn off the paper bills and statements have stagnated at less than 25%. 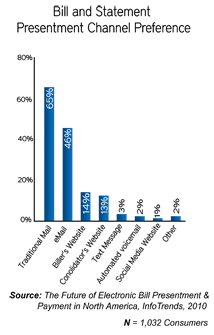 Nacha recently published a report that indicated this figure is not expected to increase in 2011. The overall industry average is closer to 18%. Only when billers begin to give customers what they actually want – the true convenience of electronic delivery – will the majority of them go paperless. Your customer has spoken. Are you listening?